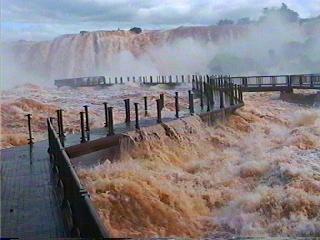 Argentina Discovery - From Uritorco water flows down, many in underground, coming to form springs. The hill was formed by Paleozoic blocks failed and promoted. In its vicinity (north side) are "Los Terrones" Indigenous Park, Cultural and Recreational, place of historical significance, cultural and landscape, maybe they would treat a geological fault that really attracts attention for its different terrestrial composition, color and the variation of different narrow pasadisos, wear wind or marine, that giving the form of a "haunted landscape" others call it "a place of wonder" also culturally these lands were inhabited by some members of ethnic groups that inhabited the comechinghones throughout the province of Cordoba, the Bird hill of 1690m, is the second highest of the Sierras Chicas, and the valley of Ongamira or Ongamira Grotto, which until the sixteenth century was a place of settlement culture comechingone. From Uritorco water flows down, many in underground, coming to form hot springs, among these courses highlights the small river Calabalumba-almost dry during the summer, which is headed west through Capilla del Monte. Scenically, the Uritorco presents great attractions. To begin, it stands as a mass of steep slopes between the other mountains. During the evenings of days clear, precisely at the moment of sunset sun, much of the slopes takes a bright golden color. From its summit there is a magnificent belvedere of the valleys that surround it. The viewpoint is located on the most common level of clouds, but these usually do not obscure vision of the lowlands, as the cool wind gusts constantly create open areas between clouds or caligine. We often see plan around the summit condors and vultures.